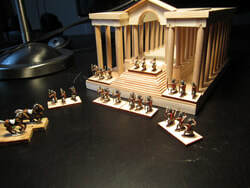 This is the Hatra temple I scratch-built from plywood which I wanted to use as an army box for the Arabo-Arameans. It is a little annoying to fumble the elements in and out, so it now mostly serves as a decorative element on one of my bookshelves. If I have the time, I paint metal cars and trucks for my father's N scale railway model. This is an 1939 Opel Blitz city bus.